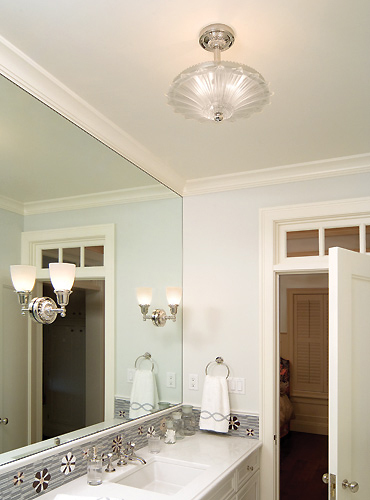 Shown with Polished Nickel fittings. This unique bowl is shaped like a fresh daisy when paired with the single stem in Polished Nickel. Each petal extrudes from the bowl defining it's shape and relief detail. The extended petals makes this glass rare in design! The center's texture even imitates the seeded pollen within the flower. Shown left, Sunflower Hollywood Bowl Ceiling Light in period context.